itsAlyx: It's Okay. Bad Blogger. Other Stuff You Just Might Want to Click. It's Okay. Bad Blogger. Other Stuff You Just Might Want to Click. So, I'm still running a little (okay, a lot) low on sleep, and am very behind on emails, but our house is finally almost a home. I promise pictures tomorrow. I'd show you some today, but the windows are all covered by grandma curtains (why can't I get away from those?? ), so I'm spending the day sewing. Anyway, I thought it would be fun to link up for It's Okay Thursday. ... That I forgot to take "before" pictures of our house. ... That I am a walking zombie. ... That I'm a little nervous to start the new job. ... That I still can't navigate my way around an American grocery store. Germany, I miss you. ... That I probably smell like fish food because I forgot to shower. Don't worry, I'll shower before I go out in public. Maybe. No, I will. And... it's okay that I'm leaving you all with a giveaway. 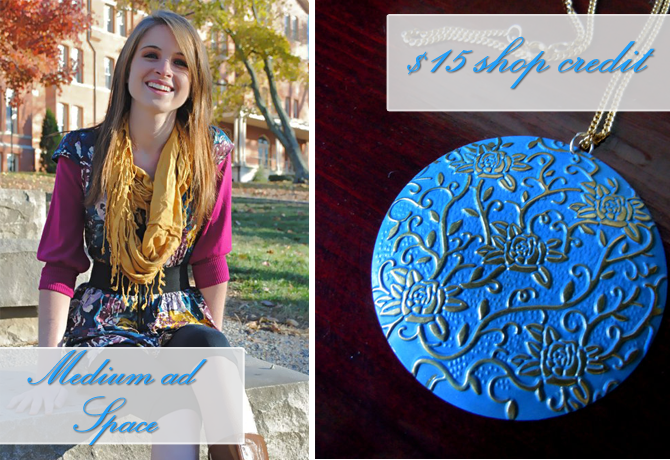 Shane is giving away a medium ad space for August and a $15 credit to her etsy shop. Note: both mandatory entries must be completed in order to win. Giveaway is open to US residents only and will close on Monday evening. Can't wait to see it all!! And get some sleep love!! You're gonna be great at the new job don't worry 'bout it! Aw, you poor thing. I will say, though, that I am floored by how quickly you guys seem to be settling in. I mean, photos already?! Whenever I move (and mind you, I've only moved into small 1 or 2 bedroom apartments before), it usually takes me at least a month before I've gotten most things how I want them and feel that I'm really at home. So...major props to you & Mike. I can't wait to see pictures (especially of the curtains you're sewing! You awesome little seamstress, you). You should save the fabric from the granny curtains and make something awesome with them, Sound of Music style. Don't be scared of your new job! There's nothing about it you aren't more than proficient at, and it can't be any more challenging than moving away from all of your friends and family to a country you barely know for a year. Since you've already one that, this should be a breeze! I get like this once a month and then I just delete all of the old emails that I can't get to. It's like losing 100 pounds! It is TOTALLY okay to be nervous before starting a new job! Showers are a bit overrated. Just one before you start the new job should boost your confidence, right? So first things first... How much did I miss reading your blog the last two weeks I've been away?!?! Damn girl, I've missed your posts. But I'm back stalking your blog again, so yippee! Excited to see your new place!!! !